THE BAR ON 98 Parnell Street has gone through many incarnations over the years. According to Come Here To Me, it served as a family grocers from the nineteenth century until the early 1960s. Since then it has housed everything from Zagloba, a pub aimed at the city’s Polish community, to the Dublin Supporters Bar. In November, the space welcomed its newest tenant, The Big Romance. 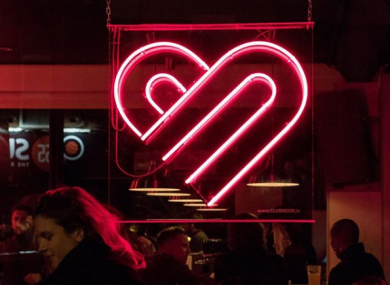 Founded by Hidden Agenda’s Dave Parle and Stephen Manning, The Big Romance is a vinyl bar with a craft beer bent. The duo have spent years putting on gigs and club nights around the city, but this marks their first foray into the pub trade. In 2016, Parle was traveling around Japan and was taken with the vinyl bar culture that existed there. Over the next few years, they set about finding a suitable space, eventually settling on 98 Parnell Street. Inside, the bar is home to a front room and lounge space. The walls are black, but the bar’s signature red neon sign ensures the room doesn’t feel too dark. “It seems to remind people of a New York dive bar,” says Parle. The name of the bar is partially inspired by the David Kitt album of the same name. It also serves as a nod to a particularly legendary romantic liaison. “We spent a lot of time trying to come up with a name that resonated with the area on Parnell Street,” explains Parle. We came across the story of Charles Stewart Parnell and Kitty O’Shea. They had an affair that went on for years and that linked in nicely with the idea of ‘big romance’. Music is at the heart of The Big Romance. On any given day, you might find the barman playing Radiohead’s OK Computer or a guest DJ spinning gems for their own record collection. On Fridays and Saturdays, the bar tends to turn into a dancefloor. Going forward, the bar has plans to host listening parties whereby people can gather and listen to classic albums in the bar’s lounge. The bar’s other main focus is craft beer with the likes of Whiplash, Rascals Brewing Co, Cloudwater Brew Co, To Øl, and Kinnegar all available on tap. Additionally, the bar regularly hosts tap takeovers with the likes of Yellowbelly, White Hag and Garage set to make guest appearances over the coming weeks and months. The Big Romance also has an impressive food menu with culinary outfit Chew serving up toasties and bar snacks with a twist. Think kimchi cheese toasties, house olives and currywurst hot dogs. Parle says running a bar has been quite the learning experience so far, describing it as “all-consuming”. “As much as I had experience of putting on shows in venues, I had never been on the other side of the bar, really,” he says. As far as he is concerned, the positive feedback from punters who have stopped in for a beer and a bop has made it all worthwhile. Email “'It reminds people of a New York dive bar': From Polish pub to vinyl paradise on Parnell Street”. Feedback on “'It reminds people of a New York dive bar': From Polish pub to vinyl paradise on Parnell Street”.